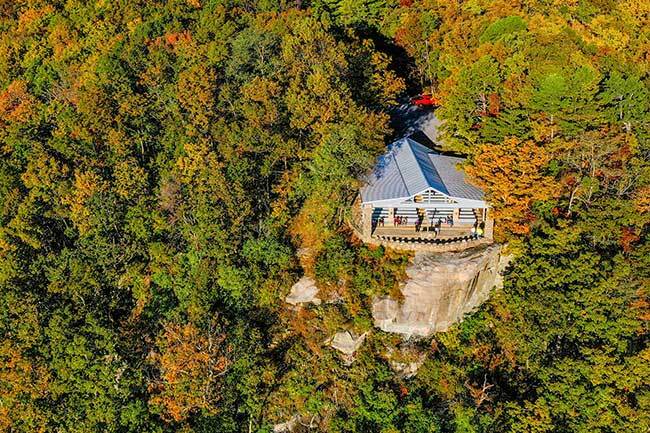 Also known as “Pretty Place,” the Symmes Chapel is part of YMCA Camp Greenville, a branch of the YMCA of Greenville near Caesars Head State Park. 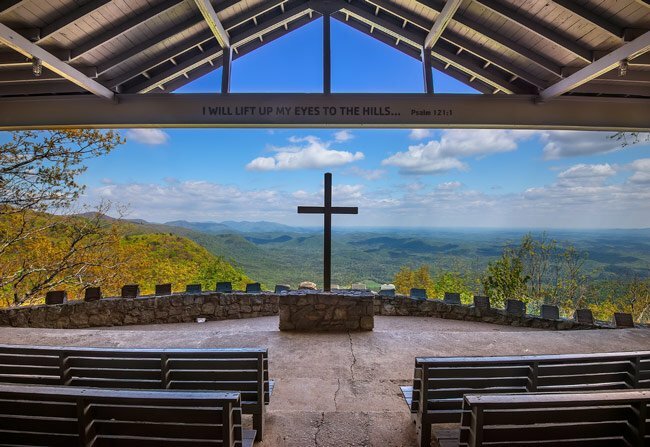 Fred Symmes gave the chapel to the YMCA so that its campers could enjoy its beautiful view all summer long. Camp Greenville spans 1,400 acres and serves as a summer camp, conference center, and environmental education facility. 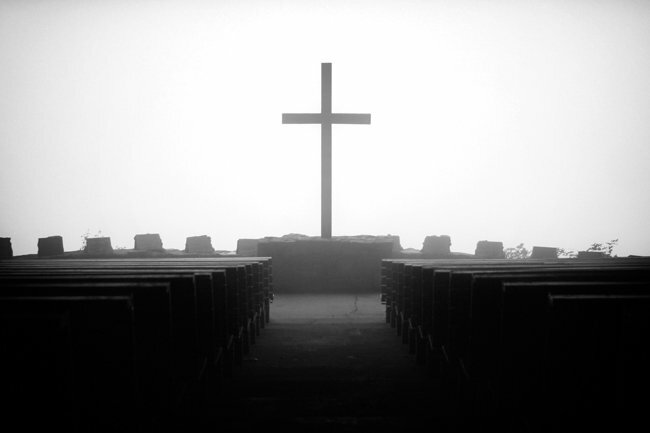 Symmes Chapel is a popular wedding venue and worship site, and visitors are welcomed except when it is in use for events. It is strongly advised to call ahead and check the schedule before planning a visit! 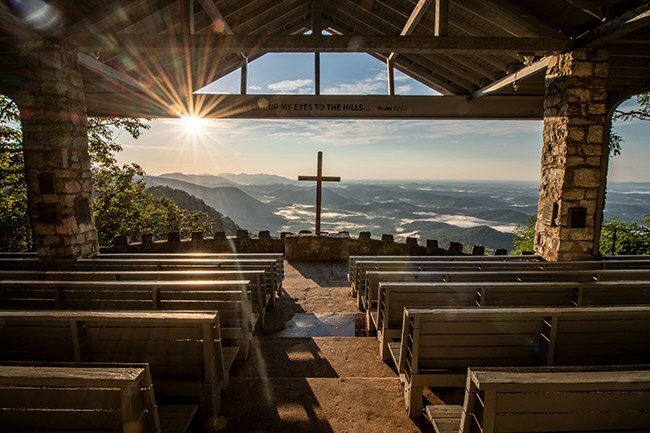 Symmes Chapel is by far the most popular attraction within YMCA Camp Greenville, and many do not realize that the property also boasts a vast expanse of wilderness, including several waterfalls. 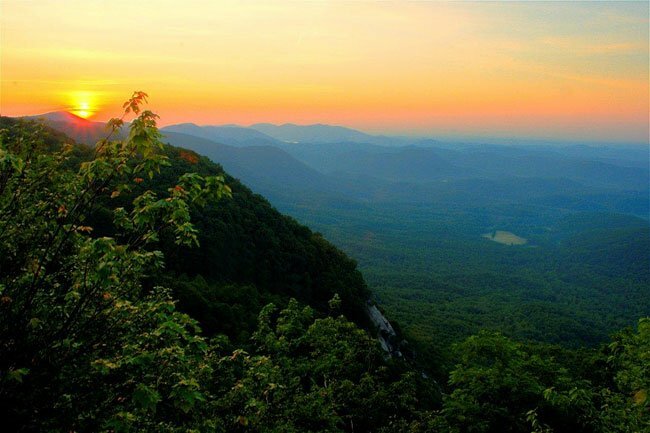 The property spans 1,400 acres on the eastern ridge of the Blue Ridge Mountains. 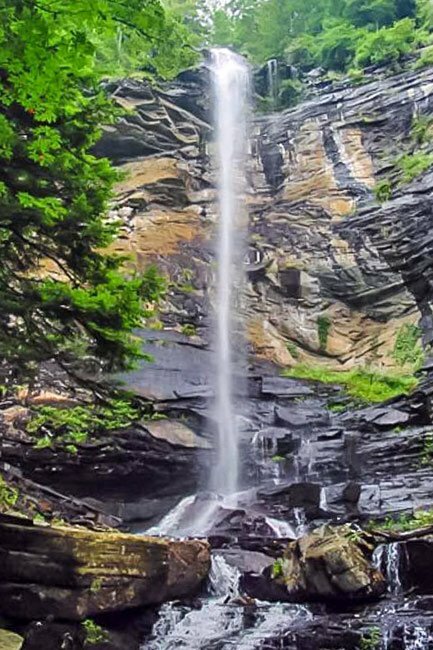 Rainbow Falls, a spectacular 140-foot waterfall, can be seen below. Wonderful! We attached the photographer on an email, you should receive a copy. Thank you! 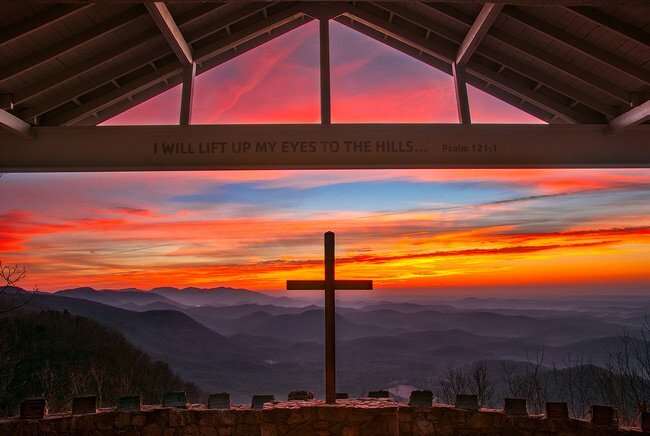 We would like to buy the sunset picture of the chapel to have matted and framed for our home. Can you let us know who to contact? Very Spiritual……. Thank You – God Bless ……. I had 2 of the most wonderful experiences, witnessing a former 4th grade student get married and taking in the breath taking view from the Chapei on July 30 ,2016. Lookig forward to the wedding in June. Pictures do not do this justice. More than gorgeous. How crowded is it on a weekend in October for taking about 30 minutes worth of pictures? Can you visit any time? How much does it cost? Who do we talk to about going? 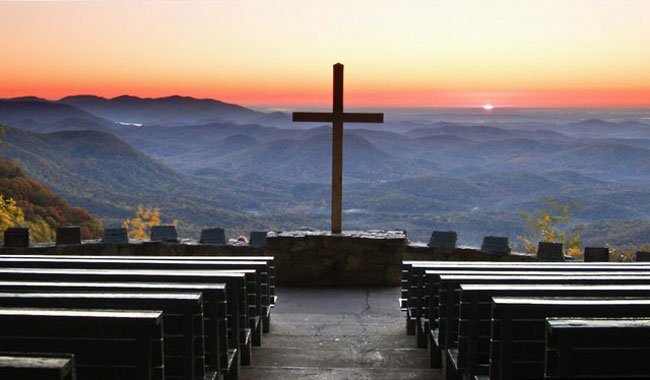 I have added the Pretty Place chapel view to one of my “most beautiful places in the world” list. We have visited 5 years and hope to see it again! The photos are absolutely breathtaking. Thank you for sharing. What a beautiful and spiritual place. Can't wait to visit. This is the most amazing view I have ever seen. I can't wait to go back again. Beautiful! Oh, my… so pretty. SC is so pretty. Look at the beautiful sunset ! The website for Camp Greenville is listed above the map. Hopefully, someone there can answer your questions. Best of luck! How much does it cost to have a small wedding here, and how do you get a date to do it? Do we have to get someone to perform it? Hi, Minnie! A trip to Pretty Place is a worthy goal! The chapel is part of a YMCA camp; the website is posted above the map, which should help you with planning a visit. It is a very popular wedding destination, so you will want to be sure one is not taking place when you go. Safe travels! We are making a trip down this summer and would love to visit this amazing place. Does it cost anything, or is it open to the public? HOW MUCH DOES IT COST TO HAVE A WEDDING A SUCH A BEAUTIFUL PLACE? MY FIANCEE AND I ARE REALLY LOOKING TO GET MARRIED HERE WITH SUCH A WONDERFUL VIEW. Windy in places, but well worth the effort. I was there last week. I would like to know about the road leading to the Chapel. Is it a steep and narrow road? This gives me goose bumps seeing such a lovely place. My husband passed away April 4th 2012 and his name was Charles Hardin same as the man who took the pictures. He had brain cancer and really loved the lord. Being born in Gaffney, S.C. I have put this on my list as a must to visit. To beautiful to even describe from these pictures, and I hope to see it by being there one day soon. God has truly made a beautiful earth if we would all just stop and look around and we are so blessed. Absolutely beautiful pictures. Our son and daughter-in-law were married there June 11, 2011. Your pictures are gorgeous. Is there a way I could purchase a set? We visited this beautiful chapel on Saturday with the one I love in hand and spent time taking in all of God’s beauty and spiritual connection. A kiss to remember for sure. My husband and I were engaged there back in 2008. Thank you so much for taking me there with you today, and making me discover the beautiful and the holy places within my Head. I was so glad to see the beautiful pictures. This is a must see in South Carolina. When you walk through the doors of the Chapel, you will be in awe of the beauty. One of the Upstate’s most beautiful places. 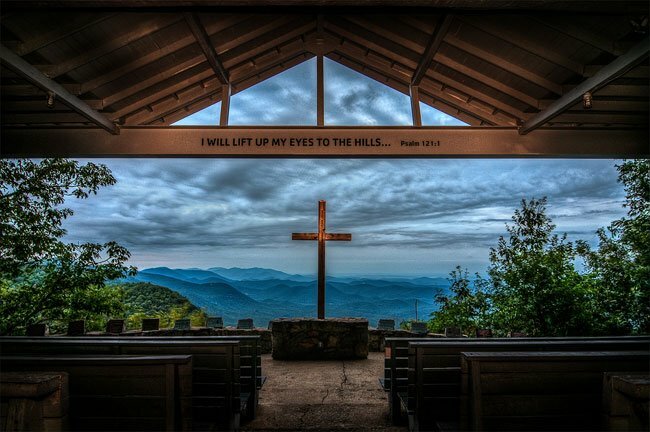 Although I’ve never been to Symmes Chapel in person it reminds me of the Mountain of God. I hope that someday my wife Rhonda and I can see it in person. Visited once with a group – awesome – hope to visit again one day. Wow — what a view! How do you get there! !